Temperatures start to dip and cold weather accessories became an absolute must when it comes to venturing outside. Caps, scarves, earmuffs and leggings are your new best friends when the temperature dips low enough, but who says function can’t be fashionable? 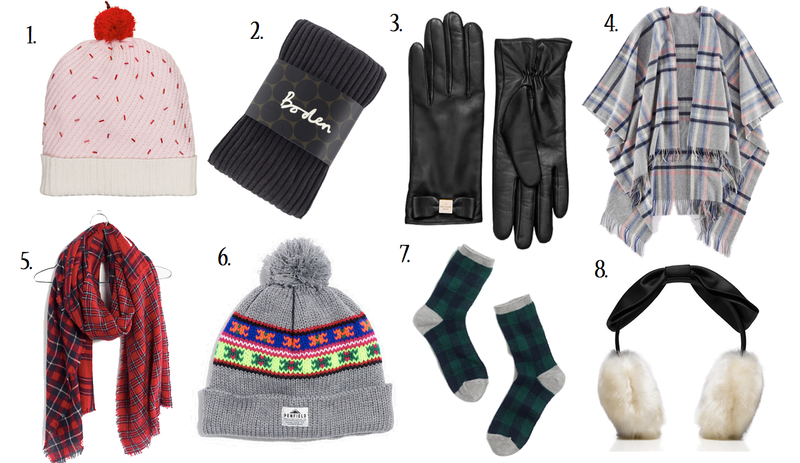 While the weather in SF is still really warm, I’m definitely planning ahead for when the weather gets a big frightful. Scarves and gloves for walking to and from work, socks to keep me cozy at home and cloaks to keep me warm while working in the office. All the necessities I need in all the cutest colors and styles. The absolute must on my wishlist right now is the Boden Helena cape. I want to drape this over my chair for whenever the air in my office takes a chilly turn. It’s 100% wool and totally oversized, which makes it both chic and useful! These are perfect. My favorite is the poncho! It's finally getting cold enough in TX to wear sweaters! That hat is so cute! I need to start gearing up for the cold in Chicago soon! All of this is so cute!! I love the cape and I just learned about Boden and now I'm hooked!! Great Picks! #1 is my favorite. Its still a bit warm here in Louisiana also but I can't wait to the cooler weather. I can't wait for it to get cold here in L.A., but once it does I'm definitely going to get those gloves! I just bought 2 ponchos this year for keeping me warm. Every time I've worn them, people have complimented me! They are so comfty AND cute. Those earmuffs are everything, I need a pair. I love that cape but I pretty much love all these outdoor accessories! OMG that cape/poncho thing is gorgeous. I want one so bad!